Troubled computer and software giant HP has confirmed the departure of chief Leo Apotheker, after he was ousted by the board on Thursday. During his 11 month tenure, Apotheker has seen the company’s share price plummet after several u-turns on company strategy. Of note is the $1.2bn purchase of Palm in 2010, which has now been written off and WebOS, the software HP was so keen to get its hands on at the time, has been binned. The move was a complete u-turn on plans announced in March under which the WebOS operating system would be installed on every PC shipped by HP. In fact, HP is getting out of the hardware business altogether, despite it being one of the world’s biggest players, with Apotheker announcing plans to spin off the Personal Systems Group as a separate entity if it can’t find a buyer. This week HP began laying off over 500 staff directly involved in the WebOS platform and the company is refocusing on cloud computing, following the recent $10bn purchase of Autonomy. It’s the second time in two years Apotheker has been forced out of a top role. He joined HP from SAP, which he left under a cloud, after SAP was accused of stealing software from Oracle and reselling it to the latter’s customers at a reduced price. 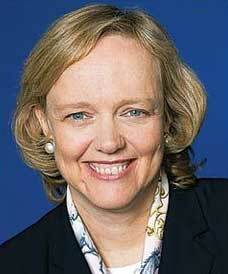 HP’s new CEO, effective immediately, is Meg Whitman, the former head of eBay, who is credited with building it into a global force, has a history as strategic planner at Disney and once ran for governor of California.